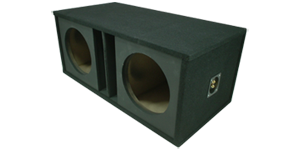 We stock many different types of subwoofer boxes. If you are looking for a subwoofer enclosure for your subs we have many different solutions. Vented subwoofer boxes will make your subs hit harder, but will lower sound quality. Sealed subwoofer boxes will give you a clean sounding tight bass sound, but you will have less output. We have a wide variety of sizes, and types to fit almost any application.